I’ve been crushing on the farmhouse style decor, especially in the kitchen, for a while now. I love the look of the white planked wall in the kitchen and I knew I wanted that achieve the look. How do I get the look without the price? I dismantled a bunch of pallets. I then removed nails. The pallet nails are little stinkers. They don’t just come out easily. Some of them actually put up a fight, but I won. Pallet boards are rough and contain tons of hairy fibers. Using a palm sander I gently removed as many of the hairy fibers that I could. I then sanded off any huge defects. I wanted the boards to be smoother then most of my rustic projects, but not to smooth like store bought wood. The look I was going for was less rustic then my pallet wall in the living room. Don’t get me wrong, I love that pallet wall, but I want more of a store bought planked wall and less rustic. After screwing the pallet boards on to the wall, it was time to paint. I painted the pallet wall using the same paint I used for the trim of the entire first floor. I’m a Glidden Duo fan. Duo contains a built in primer so no need to primer just paint away. It works really well and saves money. 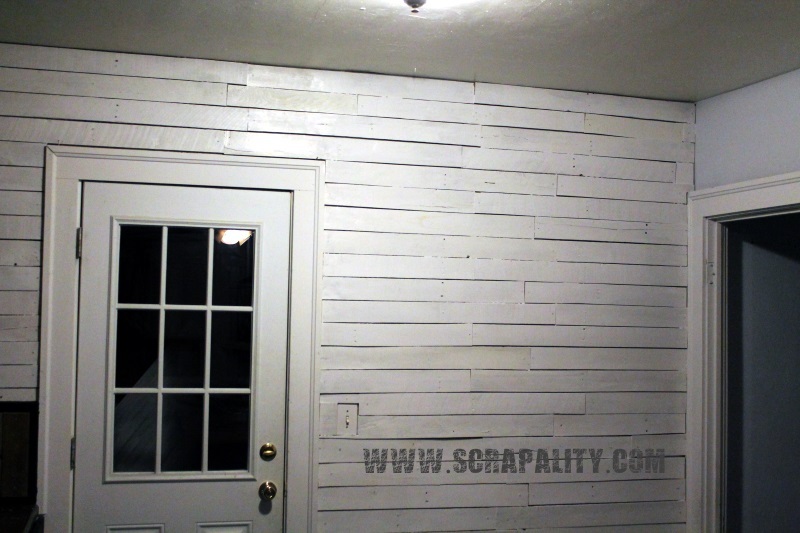 The wall is super rustic yet features the farmhouse style that I so desired. Next up, shelves. Check out shelves made from old wooden clamps and pallet wood. I’m linking this project up to this weeks Scraptastic Saturday here on Scrapality.com and some or all of the following linky parties. Very nice. Good tip too. I love this so much! I am digging the rustic look these days and all the ways people are using pallet wood to decorate! Wow! You are like the pallet whisperer. Great job. I love your wall. Ooh, those pallets are so hard to come apart. This is a battle that I haven’t won yet…so congrats on winning yours. The results were worth the fight. Totally love this look! I have wood planked wall on most of my walls and love them..so warm and cozy feeling I would love for you to share with us at Party in Your PJs. This looks really cool! I’m doing our mudroom and would love plank walls, but yeah, they are expensive! Where did you find the pallets? I’ll be starting a link party this weekend called “Found & Foraged” and would love to have you link up. 8 PM on Saturdays at http://www.averystreetdesign.com. Hope to see you! Wow! This is amazing! I might have to steal this idea for our new Country Home. Thanks for the inspiration! Found you from Funky Polkadot Giraffe. Nice job! I don’t have the patience for all those nails. That’s perseverance!!! Looks so good! I hear ya on those pallet nails being stinkers! I’m definitely coming back to your blog for pallet ideas 🙂 Thanks! Definitely has the farmhouse appeal – love your wall. Where do you find all your pallets? I would love to do some projects with pallets, but I have no idea where to get them. Thanks again for linking up to the Merry Monday Link party and hope you can join us again tonight at 6pm PST. That wall is so pretty! It reminds me of some of my aunts’ and uncles’ homes when I was little. It’s such a nice effect! Such a great idea to use the pallets! Really gives it a farmhouse touch. Thanks for sharing with SYC. 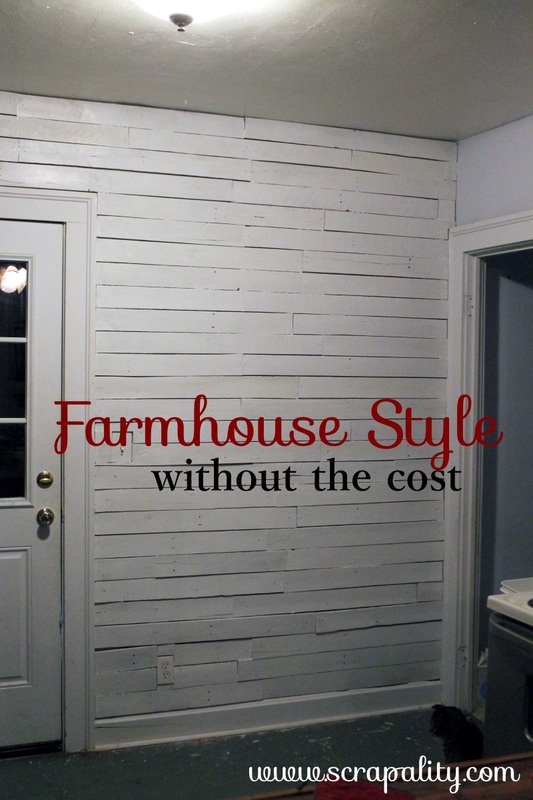 You achieved a great farmhouse look with your pallet wall. I love it! Thanks for linking up at the Home Matters Link Party! What a great idea! I love the look of these pallets on the wall! Thanks for sharing with us at Motivational Monday!